When it comes to low-cost portable basketball hoops that offer the best bang for your buck, there is no company that has focused more on this market than Lifetime. A simple review of their website or your favorite retailer will show you a seemingly endless list of Lifetime hoops that come in at under $400. Because of this, Lifetime should be the first brand you research if you want a cheap hoop for the family. Their hoops are Made in the USA and feature a 5-year limited warranty to give you extra confidence in your purchase. One of Lifetime's value portable basketball hoops is the Lifetime 90585 Portable Basketball System. At under $200, this hoop is a great pick if you are looking to stretch your dollars while still bringing the game of basketball to your home. There are three materials used for backboards: polycarbonate, acrylic, and tempered glass. The Lifetime 90585 features a 48 inch polycarbonate backboard. Polycarbonate is the cheapest backboard material. On the plus side, polycarbonate is extremely durable and unlikely to break under normal usage. The biggest con of polycarbonate backboards is that they are not responsive and often perform in a manner that can best be described as "dead". This means when the ball hits the backboard it will not come off with much velocity. Hoops with polycarbonate backboards are not great for practicing bank shots or rebounding. 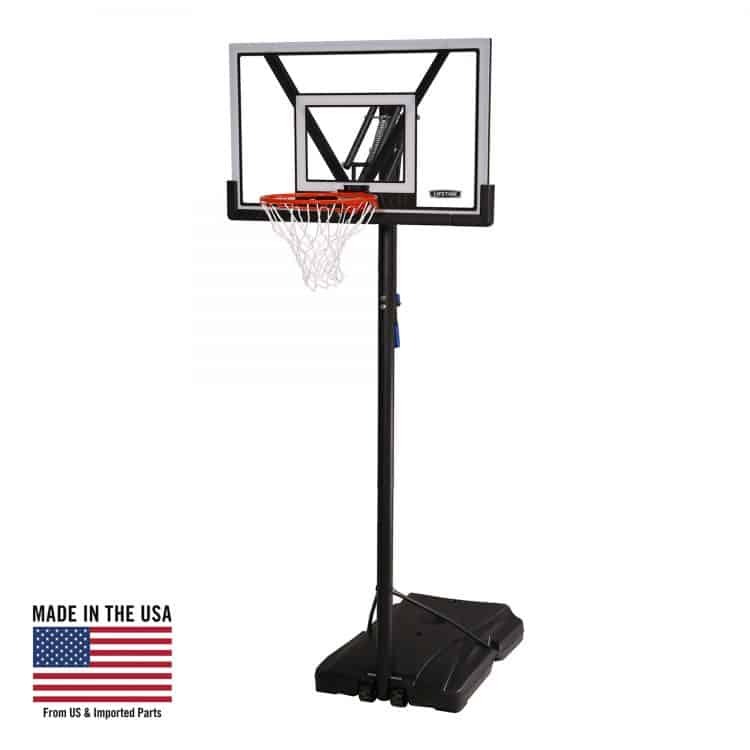 Featured on the Lifetime 90585 Portable Basketball Hoop is a slam-it spring rim. If you are expecting a gym quality rim on this hoop then you will be disappointed. The spring and rim on the 90585 are not on the same planet as top of the line systems. Having said that, the spring does allow for some moderate compression and enhanced durability. For casual and recreational players, the rim on the Lifetime 90585 will be just fine. If you are an advanced player who requires premium performance we would not recommend this rim. Found on the Lifetime 90585 is a 3-piece support pole. This 3-piece support pole is round and has a 3.5 inch diameter. This is common dimension for low-cost basketball hoops and is par for the course as far as quality is concerned. 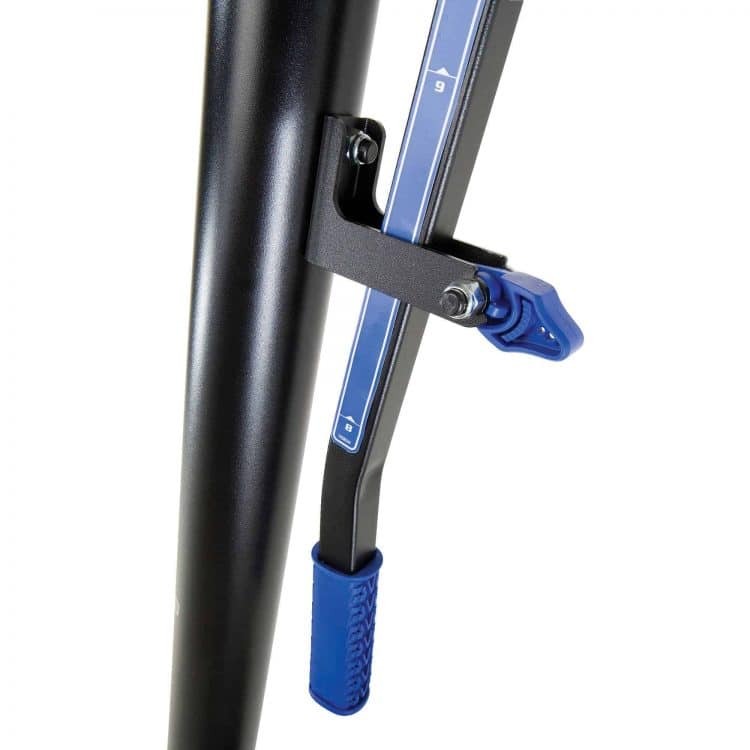 3-piece support poles are more susceptible for additional vibrations when using the hoop due to there being more weak points. Also, these connection points can lead to rusting over time with the small openings that can allow moisture to creep in. Again, this is to be expected when you are looking to buy a hoop that has a price point under $200. If you understand this going in then you'll be sure to be satisfied with this hoop. Fill bases are a critical part of a portable basketball hoop as they work to ensure that the hoop stays upright during inclement weather and during dunks. Generally speaking, the larger the capacity of the fill base the better. For those who buy the Lifetime 90585 Portable Basketball Hoop you'll find it comes with a 31 gallon plastic fill base. This is on the small side for fill bases, but considering the smaller backboard and lightweight nature of this system it should be adequate. At the same time, we would not recommend dunking or hanging on the rim of this hoop as it could tip.